At least Rodriguez told the truth: his 24 Karat Baccarat method does indeed win both Zumma 600 and Zumma 1000 shoes. 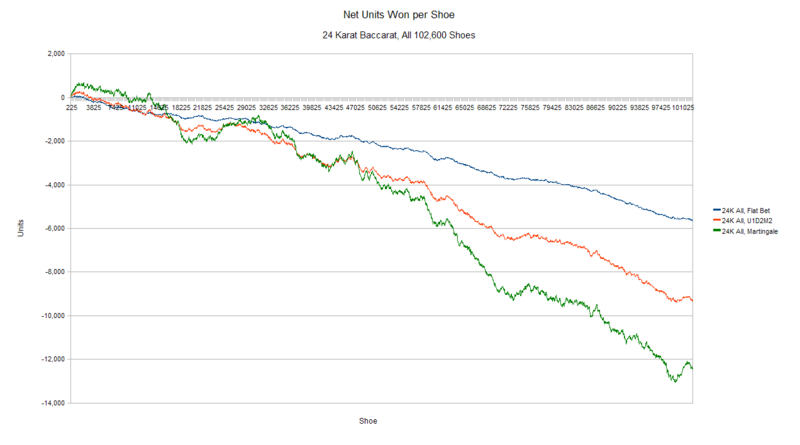 However, testing his method over 102,600 shoes shows that in the long run, Rodreiguez’s method offers no actual positive edge, yielding Player’s Advantages no better than single-side betting (ref. Series 14 Results, Series 1 Discussion). Interestingly, the above score-vs-shoe graph shows localized stretches of positive performance which can occur over many thousands of shoes. A most remarkable run of 12,000+ shoes from roughly shoe #19,000 to #31,000 showed a generally positive trend. However, the overall trend is quite clearly negative. Rodriguez’s method assumes an existing shoe bias will tend to normalize (thus committing the gambler’s fallacy). It bets only in 3 groups of 5 decisions in the last half of the shoe. It uses a 5-level Martingale based on 5, 10, 20, 40, and 80 units. In my simulation, I reduced this Martingale progression to the equivalent of 1, 2, 4, 8, and 16 units. I also used U1D2M2 and flat betting. The results show that when flat betting is generally break-even or positive, negative progressions enhance performance, but when flat betting is negative, then negative progressions only lose money faster. This has been a common theme in all of my simulation results. As is true for Scott’s (eirescott) Birthday Grail method (ref. Can Betting on Birthday’s Make You Rich? ), Rodriquez’s method bets relatively infrequently. Hence, the ups and downs in the score simply become stretched out over a longer period of time, making the fluctuations more prominent on an inter-shoe chart basis, fluctuations which would be just as apparent on an intra-shoe chart basis for methods betting every decision. This is another good example why a sufficiently large sample size is crucial to accurately access a method’s long-term performance. Because any kind of shoe may arise during live play, a sufficiently large testing sample is needed to cover as many variations as possible. This is also a good example why beating Zumma shoes isn’t nearly enough to establish whether a method truly has a positive edge. The number of possible baccarat shoes is in the quintillion, and even 100,000 shoes is barely scratching the surface. Being able to beat Zumma is a good start, but it is definitely not sufficient to declare one’s method, in Rodriguez’s own words, “just short of a miracle” (his emphasis). It is very short of such. This entry was posted on October 29, 2010 at 5:31 pm and is filed under Life with tags 100000 baccarat shoes, 24 Karat Baccarat, 24karatbaccarat.com, analysis, baccarat, baccarat simulations, baccarat simulator, banker, bet, bet progression, data, flat betting, Lorenzo Rodriguez, Martingale, mathematical advantage, mathematical edge, method, miracle, money, money management, player, results, sample size, shoe, strategy, system, testing, trigger, U1D2M2, Wizard of Odds, Zumma, Zumma 1000, Zumma 600. You can follow any responses to this entry through the RSS 2.0 feed. You can leave a response, or trackback from your own site. Are we trying to find a winning system at baccarat? Let me know I may have a better edge to add to your testing. Thanks, Bob. Appreciate your thoughts. Well done. At least Lorenzo didn’t lie about beating the Zumma testers, but the system is truly Fool’s Gold after all! If you find methods that fail over the long run, why don’t you reverse the method, should be the opposite of its performance. Thanks for your comment and suggestion. Unfortunately, that won’t work. I have, for example, already tested your suggestion in a few of my simulations. Betting Repeat is the opposite of betting Opposite. Betting Time-Before-Last is the opposite of betting Opposite-Time-Before-Last. Betting Banker always is the opposite of betting Player always. Etc. Indeed, some players are bold (and brash) enough to always bet against the majority bet on the table, or to just counter-shadow the player who seems to be on a losing streak. The reason why these opposite kind of strategies don’t work is simply because in the long run, all methods only fail just enough to yield the house vig. That is, the accuracy of any method conforms to what is mathematically expected, and you pay the vig. Reverse what you did and the results will still be the same, because where you were wrong before, you will now be right and vice-versa, but still, the accuracy conforms to mathematical expectations, and you pay the house vig. Notice that the Player’s Advantage in all of my simulations is always around -1%ish. That is the house vig. You win and lose about 50/50, and you pay the vig. Reverse what you did, and you still win and lose about 50/50, and you pay the vig. Indeed, this is somewhat good news, because as long as you flat bet consistently, you shouldn’t lose significantly more than 1% of your total bets in the long run. Your suggestion would work on a method that yielded, say, a P.A. of -2% or worse over the long run. Reverse that method, and you would indeed have a long-term winner. Because the original method lost more than the house vig, you will gain that much by doing the exact opposite. Show me such a method, reverse it, and I will show you the Holy Grail. Funny, though, no such method exists, because it is just as hard to lose big as it is to win big in baccarat. Incidentally, betting opposites is also something traders try to turn a losing trading method into a winning one. Even in trading this doesn’t necessarily work long term, partly due to the spread (which is basically commissions), and partly due to the ever changing nature of the markets (you never know when a recently losing method will become a winning one, and vice versa). Thank you for your reply, my next question would be. Then how do professional gamblers do it. To the best of my knowledge, there is no such thing as a “professional baccarat player,” someone who is able to play baccarat exclusively for a living and can actually make a consistently good living at it. In the long run according to my simulations, such a player will always wind up paying the house vig at a minimum. He may have lucky streaks which may even appear to last quite awhile, but eventually, because the odds are against him, he will give up his winnings, and pay at least the house vig. I know some people claim to be professional baccarat players, and I’ve even paid a lot of money to learn from them, as I’ve detailed in many of my blogs here. But objective evaluation of how they play clearly shows that their methods do not have any true positive edge. If they are winning, they are enjoying a lucky streak. And, they have very deep pockets and are able to temporarily weather out the drawdowns to eventually come out ahead with some luck. After all, people win the lottery against all odds, so it’s certainly within the realm of possibility that some can seem to “always” win at baccarat. But the truth is, they are just lucky, and someone else playing their same methods may or may not be able to enjoy the same winnings. The math is not on their side, and the more they win, in fact, the higher the probability that they will lose next time. Not a very secure means of living! Indeed, my whole motivation for running these simulations is to try to find a method with a truly positive edge, one which someone could confidently play and expect to win long term, one which the more it is played, the more it will win. Only with such a method could one truly be a professional at this game. However, thus far after scores of testing, I have not yet found one such method which could remotely be justified as a professional-grade baccarat method. So far, the method which yields the best expectation for the player is simply always betting Banker! No surprise, since that is how the game was designed. The true professional gamblers who can make nice livings at playing casino games do so by playing games in which some skill is required, such as poker, blackjack, or even sports betting. In such games, the player’s fate is not mathematically sealed by chance alone, and with enough talent, experience, knowledge, perseverance, bankroll, and, yes, luck, such professional gamblers can live the kind of lifestyle that would be the envy of most others. Still, even these professionals have to weather drawdowns. Even with great skill, it’s not easy being a professional gambler. Great website, great attitude, great resource. Thank you. When can I access a few thousand of those sim shoes you mention? I’ll be glad to share my results with you in as much detail as you want. (Thanks also for the phrase analysis paralysis – hadn’t heard it before and I think maybe sometimes I’m a victim!). Thanks, Seth. I’d be happy to send you some shoes. Can we know how much did this method win upon both zumma testers and what were the max bet and drawdowns? If possible, a graph of that. Was it a reverse engineering or those data just suit his method? Most likely he simply reversed engineered the Zummas, which seems to be a common sport among system designers. As my results clearly show, though, the method is not sustainable beyond that limited data set.